Our best-selling cheese package! When they open this gift, the party will begin! Our elegant eco-friendly Bamboo cutting board with your imprint, of course, comes packed with all the necessary ingredients for a party at home or at work, including seven-ounce blocks of Provolone and Mild Pepper Cheese that do not need to be refrigerated upon receipt. Serves 8-12. 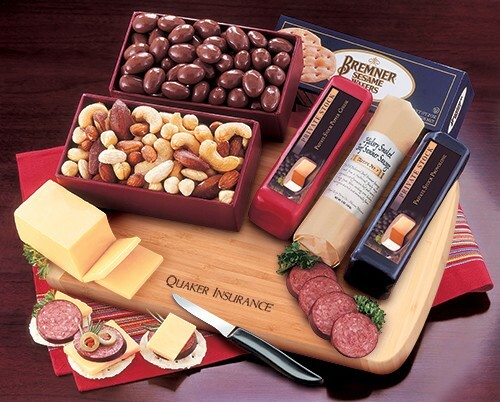 Food gifts are perfect for any occasion! 12" x 8" x 3/4"
• Price includes firebranded imprint on board. • Imprint Area: 2.5" × 1.5"